The two proteins in your skin — elastin, and collagen — help to keep your skin smooth, firm, and tight. Over time, these proteins begin to disappear, which is why your skin begins to feel looser, less firm, and youthful. One of the services that we offer at La Beauté Medical Aesthetics is skin rejuvenation. These services help to restore the look of your skin. While nothing can fully reverse the effects of aging, these non-invasive procedures will help to smooth wrinkles, fine lines, and brighten your skin, so the visible signs of aging decrease. These procedures are non-surgical and are part of a new level of anti-aging techniques to make you look more youthful. 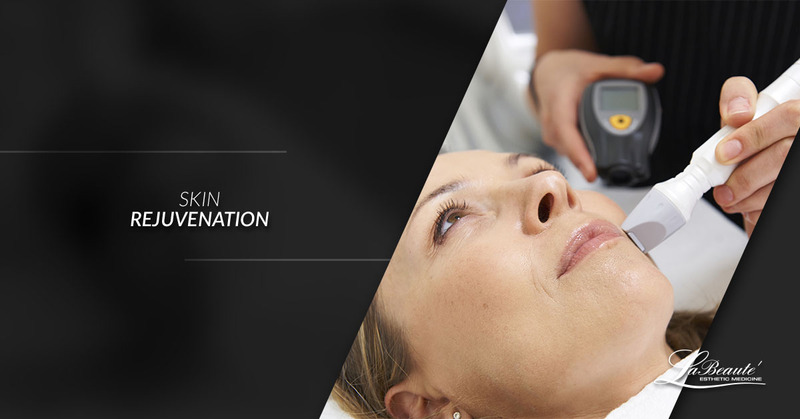 Learn more about skin rejuvenation procedure by contacting us. To accomplish skin rejuvenation, we use injectables, medical grade cosmetics, nitro-plasma, and more. Our skin rejuvenation services help with those visible signs of aging that don’t seem to go away. These procedures help with areas on your skin that may have broken blood vessels, fine lines, dark spots, sun damage, and wrinkles. Each of these signs of aging can drastically affect how you feel about yourself and your body. To help you feel better about yourself and your body, we have a few services that will help you feel more confident. Not only will these services help your self-esteem, but they’ll also help give you a glow that’s natural and youthful. This procedure will tighten the areas of your body that may be loose or need some attention. Skin tightening can help with areas such as the neck, arms, face, and the neck. When the skin loses the proteins to make it tighter and smoother, it can make you look older. Skin tightening will restore the skin laxity and improve the quality of your skin by tightening and smoothing. There are many ways to reduce the wrinkles on your face. Wrinkles occur because there is a loss of elasticity in the skin. The elasticity in the skin helps to keep your shape. Without that elasticity, your eyelids will droop and your cheeks will become more hallow. Essentially, you’ll look tired and worn out early. Our wrinkle reduction procedures will focus on the areas of your face that have wrinkles such as around the eyes, mouth, and forehead. Skin brightening is a service that will help to reduce sun damage done to your skin. It also does exactly what you’d think — it brightens your skin. This procedure will help to improve the tone of your skin, enhance the clarity of it, and create a healthier and fresher appearance. Skin brightening is an effective treatment that will make your skin look brighter and more fresh-faced. Our acne and scar treatment service will help to target areas of your body that may have been damaged. While there are a variety of acne and scar treatments in the industry, we use injectables, medical grade cosmetics, and nicto-plasma, among other methods to accomplish skin rejuvenation. Feeling self-conscious because of scars or acne doesn’t have to rule your life, seek treatment today. We also offer non-surgical face lifts. Non-surgical face lifts can help with decreasing the lines and wrinkles on your face. They can help with reducing puffiness and shadows that may be around the idea. It can also help with elasticity and circulation as well as create finger pores that provide better skin. Firming, lifting, and toning can also occur with this beneficial skin rejuvenation procedure.